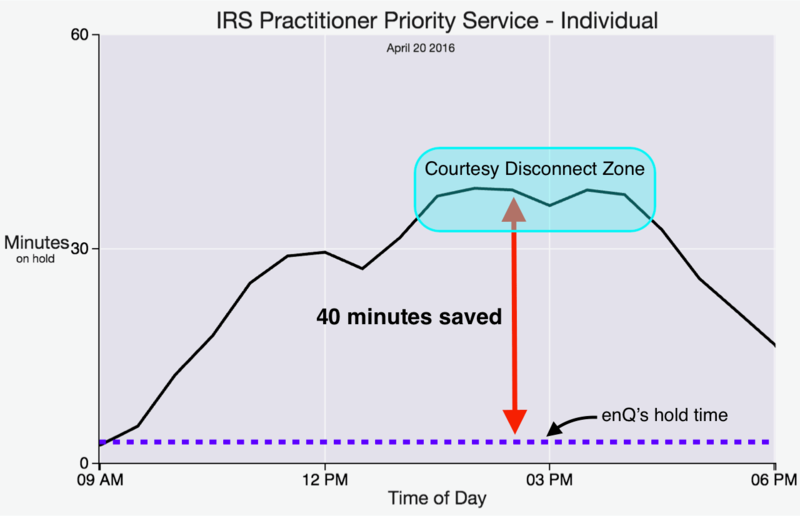 enQ reduces IRS phone hold time from hours to minutes. enQ saves tax professionals just like you hours of time every week. You call one of our numbers, take our place in line, and dramatically cut your time spent waiting to talk to an IRS customer service representative. Wasting time on hold with the IRS has always been a fact of life. Then, EnQ came along and everything changed. It started with using it for emergencies, releasing levies, end of the day calls, and impressing new clients. Now we use the service to get through to the IRS in 3 minutes on a regular basis. The cost is low and the savings of time and increased efficiency is immeasurable. We are forever spoiled. We’ve already done the waiting in line for you with our patent-pending technology! We connect you to a live IRS agent in minutes, not hours. It’s simple, stress free, and we guarantee you’ll love it or your money back! 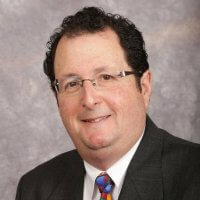 "On average, our tax resolution clients save over 50 minutes per call." What is hours of your time worth to you? Saved time is calculated from a typical tax resolution client who use all their plan minutes. The saved time does not include time saved from averting courtesy disconnects. Thus your actual saved by using enQ time may be greater than this estimate. Higher plans are also available. What do clients say about enQ? My wife was making dinner this evening - I would NOT have called Collections if I knew I was going to be on the phone 60+ minutes. I made that call this evening rather than think about it all night. So, your product makes for happier marriages and better sleep. enQ is best described as the equivalent of using a drill to a screwdriver. 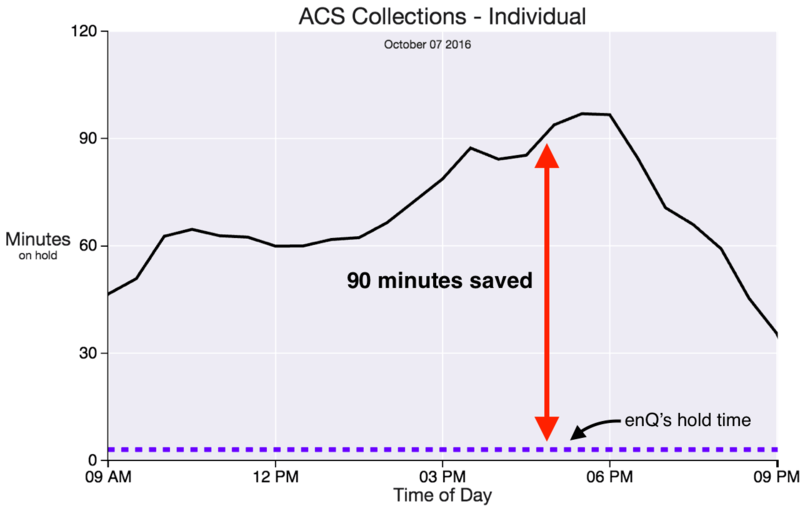 The service sheds an average of 50 minutes from well over a dozen calls to collections or PPL a day. To anyone in the tax resolution industry, elaborating further would be a waste of our time. CallEnQ is a game changer! Unless you know what it's like to call the IRS 5 times in 3 hours only to be disconnected every time, it's probably hard to appreciate. Now, I can literally call at will, and not worry about the hold time! Thank you!! Recently made a call to Practitioner Priority Service...My hold time was 1 1/2 minutes!!! Total Gamechanger!!! I had gotten used to waits of 1/2 to 1 hour plus!! I got through super quick and the service was really easy to use. I waited less than 30 seconds. I had a busy day and needed transcripts asaps when TDS was down. EnQ to the rescue! $3.50 approx cost saved me HOURS of sitting on hold. Now that's what I call value! My call was simply "flawless"! "Instead of calling the IRS and waiting on hold for a couple of years, you call enQ"
"My tax adviser just spent 45 minutes on hold to resolve something for me." "EnQ has created a system that will allow customers to avoid lengthy hold times."